To say that we have a lot of books for our boys would be an understatement. 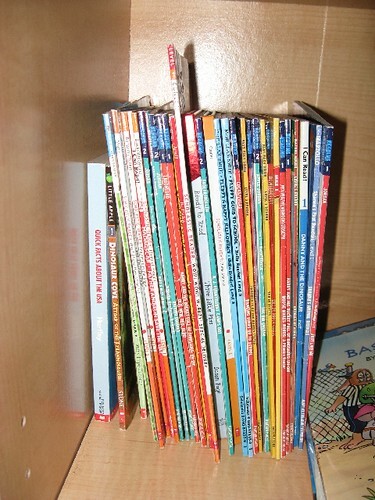 As an elementary education major, I purchased a lot of picture and chapter books from Scholastic and beyond. While student teaching I bought even more, and again while getting my masters degree in Reading. I truly do have a very large collection of books from many different genres. At one time or another I have read most, if not all of the books. When NHL was born, and then started in daycare, we added many more books to our house. Last year, we bought a book shelf for the boys room. 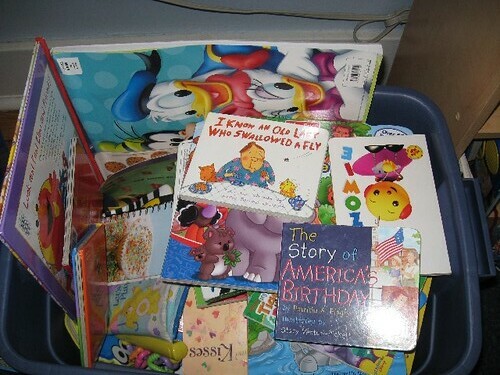 This was to house their books and some of mine that had been brought down for their age group. The boys love their own personal library. NHL and JSL are constantly grabbing books off the shelves and taking them to read. The problem, the boys rarely ever put the books back. 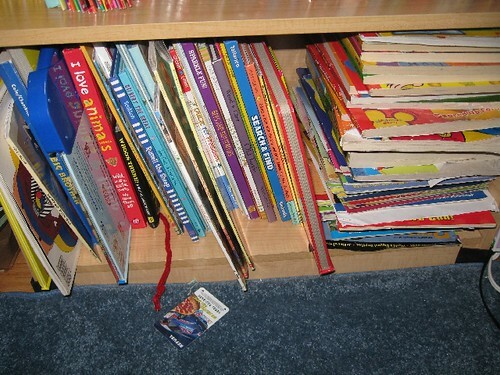 Most of the time they leave piles of books in the living room, or on their bedroom floor. 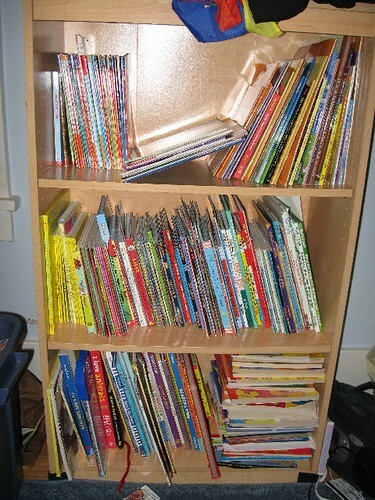 With the arrival of my in-laws last week, I had to do something about the book shelf disaster (sorry forgot to take photos of this mess). Thursday night after I was done eating dinner, I excused myself to their room to tackle the project. I took all of the books off of the shelves. I put them into a few piles and started to organize by type of book, author and so on. 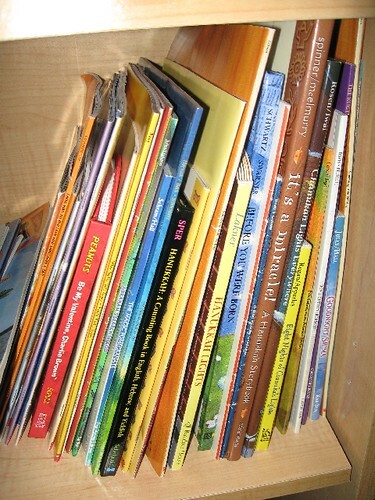 What I soon realized was there was really no room in the book shelf for all of our board books that JSL reads. As a quick solution I put them into a big Rubbermaid tote and kept moving along with my other project. It honestly did not take me long, but the result was SO much better than it originally looked (take my word for it). Here is the entire bookcase when I was finished. A closer look from the bottom up. On the botton shelf I put larger books that would not fit elsewhere, along with some of our coloring books. On the middle shelf I grouped collections of books by a single author, along with books about familiar television/movie characters. You can see all of the Curious George, Froggy, Dr. Seuss, Eric Carle and multiple other groupings. The top shelf has the early readers on the left (a few chapter books also here). In the middle I put an empty space for NHL and JSL to put books back when they are done reading. On the right are some of our Jewish book collection (many thanks to the PJ Library) and books about holidays in general. A week after this project was completed the books are still looking good. NHL and JSL have been good about only taking three books out of their library at a time. 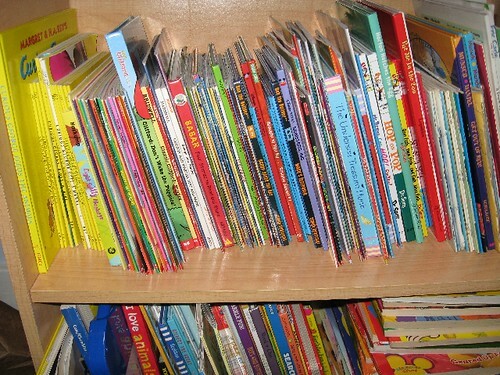 Each day I go back in and help them to put the books back away to keep it on the sort of organized side. So do you keep your books in a certain order? How do you deal with your ever growing collection of books? Inquiring minds want to know! Nati still is a bit rough on his books so we don’t let him use them unsupervised for the most part. Got a question for ya. As you saw on my Facebook, my SIL’s toys are hitting the market. I’d like to propose she send a few items to some of the blogging parents who have a large readership, are well respected for their opinions and maybe even one or two who have special needs kids. I can’t guarantee you’ll be one of the recipients or that she’ll agree to this, but I’ll do my best to make sure you get something :) Can you suggest 3 or so blogging moms and dads?